Employee training is necessary for creating a strong workforce. Instead of being reserved for the most motivated employees, employee training should be available to all. This includes training that can protect your business from employee liabilities, harassment, accidents, and more. According to Training Today, “Training topics may include (sic) programs designed to prevent lawsuits, audits, and fines, such as sexual harassment training, safety training, and ethics training ” Using a streamlined approach, which often includes automation tools, can help ensure that employees are up-to-date with job-related knowledge and corporate compliance matters. An easy to use learning management solution can facilitate employee training in many ways. Employee training using an easy to use learning management system can improve team performance and build a more positive culture that is focused on learning. Promoting a learning culture is important because it supports recruitment and retention of employees, as well as enhancing performance. Stephanie Morgan, who contributes to Training Journal, explains, “Ambitious individuals want to work for a company that provides them with opportunities to learn and grow, and where they feel that the organization’s mission and ethos aligns with their own. This is where a great learning culture comes in. ” When organizations make learning available to all employees, it sets the bar higher and creates a culture of achievement. The key to making learning accessible is to create a sustainable, easy-to-manage platform that is suitable for all team members. This learning management system should be intuitive and adaptable to the needs of employees. So too, it should grow as the company grows. Leaders can support the learning culture by establishing clear goals in terms of improved employee performance and onboarding new hires. The LMS should be able to measure the results by monitoring employee progress, while leaders can measure the impact on performance. In some cases, an organization may be challenged to find and establish a business friendly LMS for onboarding and training all new hires consistently — with safety and compliance as top priorities. Up until more recently, many learning management systems have been focused on the larger organization and have been cost prohibitive to many companies. Therefore, safety, employee liabilities, and similar issues have been left to supervisors to review with new hires. But now, there are many affordable options for growing businesses to train employees using blended learning methods. Another issue that organizations may be dealing with is low employee morale while the effort to improve performance and compliance is occurring. Employees may find online learning intimidating or stressful. The right learning management system is sensitive to the technical abilities of all employees, and the increasing mobile needs of the team. It’s critical to obtain leadership buy-in by demonstrating the value of blended learning tools. The Society for Human Resource Management “HR Magazine” featured an article by Mark Feffer, in which he advises, “Your leaders must be shown that learning underlies constant improvement, operational excellence and innovation. To get your executives excited, prove how learning can improve the business and its results.” Connecting learning to the business bottom line can earn their support, which then sets the expectations for the entire team. A concern that comes up in organizations that are shifting from traditional safety methods to modern learning methods is how to retain the knowledge of previous subject matter experts? The answer is to use an LMS that pulls in learning content from other sources, such as training manuals, videos, and other learning that has been captured. Work with SMEs to validate any new learning to make sure it doesn’t get lost or reduces the consistency of training. What should a business look for when choosing an LMS? 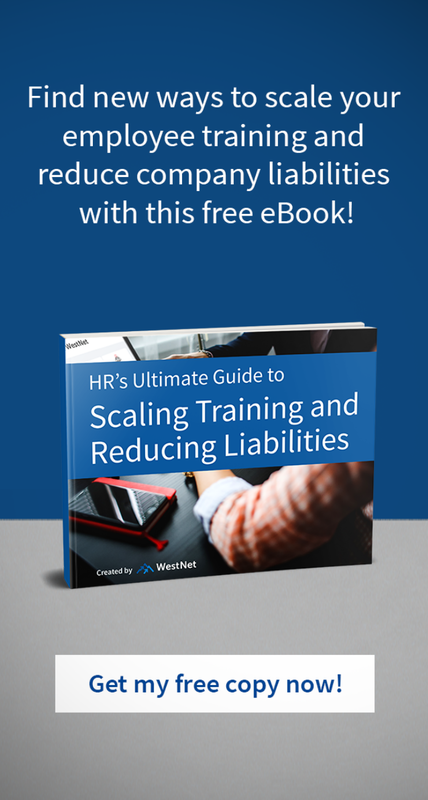 There are certain factors that can help make employee learning cost effective, while still being robust enough to handle harassment training and other employee liabilities concerns. The LMS should have the right features to grow with the company and make sure employees can adapt to changes in the industry. For example, lessons can be audited and updated at any time by an administrator. Learning analytics can prove that employees have completed harassment and other compliance training on an annual basis. The learning management system should also be able to connect well with the current HRIS to replace and improve current instructor-led employee onboarding and training methods. A candidate can be learning as soon he or she encounters the company during the hiring process. Pre-screening that includes candidate assessments can indicate their skills, which make for a better matched hire and a more structured career path. Then this same learning platform can be used for onboarding and training new hires until they become proficient. An easy to use learning management system should also encourage all levels of the organization to share information, which can create additional learning opportunities. Instead of there being silos of knowledge, more seasoned employees can share this information in a central location for all to benefit from. Supervisors can also use this platform for coaching opportunities, where they can share their ideas, best practices, and more. This promotes a true learning culture. This is the heart of what workplace learning is all about. Whether it’s harassment training, compliance training, skills training, or leadership development — an easy to use learning management system that provides data on individual performance makes it a more personalized and accountable process. WestNet Learning is a cost-effective LMS service, specifically designed for business training, safety, and management needs since 1996. No matter the size of the company, WestNet Learning provides an easy-to-use platform, utilizing the latest technology for Human Resource professionals that strive to reduce employee harassment and prevent company liabilities. If you would like to learn more about workplace harassment, or a more in-depth look at how you can reduce employee liabilities, schedule a 1-on-1 strategy session today.